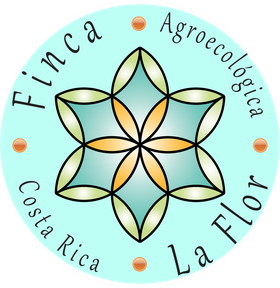 Since 1998, Finca La Flor has been managed by ASODECAH (association for the development of human and environmental consciousness), a non-profit organization that provides environmental and language education to strengthen relationships between society and the environment. The owner of the farm, Brigitte Draabe, has been dedicated to forming a community with a local focus. Thanks to her commitment, the community living here provides various ways to learn about culture and nature, relax, experience farm life and integrate into the community: dance and yoga retreats, Spanish/French/English classes, volunteering, vacation lodging, educational farm and forest tours, event hosting, and artistic residences. We have 5-year goals to be 100% powered by renewable energies, 100% rainwater for irrigation and drinking, use 90% natural building materials, and minimize trash from daily life. learning about community and sustainable practices. We enjoy sharing the skills we have and meeting all the wonderful people that visit us. We use the natural resources in our surrounding. We care for our own forest and gardens. The farm animals provide us with compost to enrich the soil. We collect the rainwater for our vegetables and animals. With projects like solar cooking or the use of bamboo and wood from our own forest we utilize the energy in an efficient way. A part of that philosophy is to seperate and recycle the waste. An important part of healthy living is the alimentation. With a lot of own products of herbal and vegetable garden we enrich the vegetarian kitchen. Also we support the body, mind and spirit relation with yoga, dance, and other practices. We have different culture exchange programs. Volunteers from all over the world come here to live new experiences, learn the language,... and there come people from the near villages to visit. All together are learning about agroecology and enjoy also to exchange individual skills like music or art.